With prior releases of the vCenter Server Appliance (VCSA), there was little to no visibility to the underlying vCenter Server Database (VCDB) which uses an embedded vPostgres Database. This was especially true for being able to get basic storage utilization of the VCDB including the breakdown of the different data types being stored. More importantly, there was no easy way to even monitor the storage utilization of the VCDB to help prevent the rare case where the VCDB could be filling up for whatever reason. In vSphere 6.5, there have been huge amount of improvements to provide customers with greater visibility into the VCDB. Not only can customers get granular into the specific types of data being consumed: Stats, Events, Alarm & Tasks (SEAT), Transaction Log & VC Inventory within the VCDB, but this information can also be easily accessed both from a UI as well as API (using the VAMI REST API) standpoint. 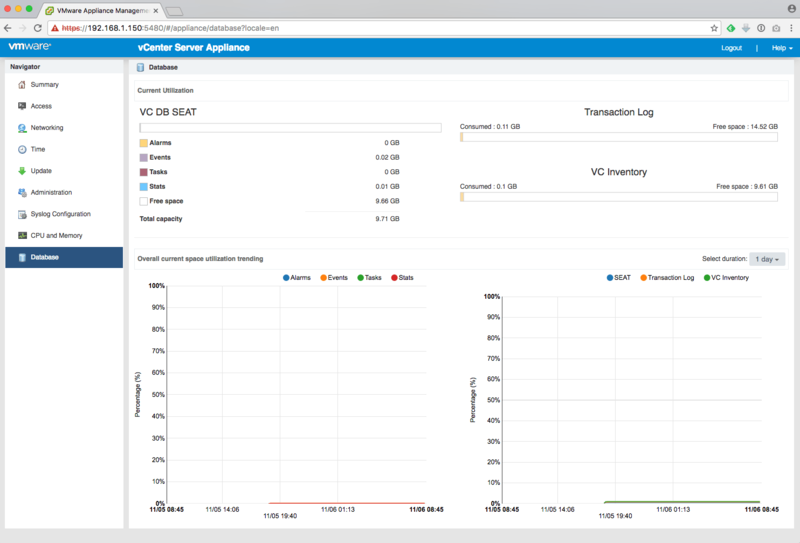 The Virtual Appliance Management Interface, better known as the VAMI for the VCSA has received a huge face lift in vSphere 6.5. As you can see from the screenshot below, there is now a Database section which gives you the current utilization of your VCDB. In addition, you can also see how this utilization trends over time for the various data types. From a reporting and visibility standpoint, this is great but how do you go about operationalizing this data and ensuring that you do not run into situation where your VCDB is out of space or is close to being out of space? 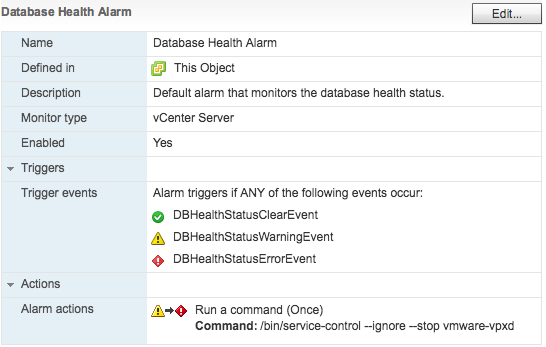 Another improvement that has been made to the VCSA 6.5 is that there is now a default vCenter Server Database Health alarm that will monitor the space utilization of your VCDB. These default triggers can be changed by simply editing the following vCenter Server advanced settings: vpxd.vdb.space.errorPercent and vpxd.vdb.space.warningPercent (restart of VC service is not required). Customers can also extend these alarms to send an additional email and/or SNMP trap to their monitoring system so that not only is this visible in the vSphere Web Client but the appropriate administrators can also be notified. The above is just one of the many improvements the VCSA 6.5 has received and I definitely recommend customers spend some time looking at what is now available in the VAMI UI as well as being able to pull this information using our new VAMI REST API. Will, I just migrated from a traditional VC (running 6.0 u2) to VCSA 6.5.0.5300 . I’m looking for that alarm for an hour without any luck. any help on where to find it? “Stats, Events, Alarm & Tasks (STAT)” STAT??? Hmm, I think you meant (SEAT). Cheers! Hi William, after upgrading VSA to 6.5 U1e the Database + CPOU and Memory statistics are no longer available. Any thoughts? Is there any way to setup a Postgres DB maintenance schedule? In the old days of Windows vCenter & MS SQL DB, setting up SQL DB maintenance schedule was 1 of the recommended best practice.